Save money and improve response rates on your direct mail campaigns with our new data cleaning service. Direct mail already has a great response rate compared to other forms of marketing communication. We’ve now launched a new service to give you an even better response rate on your Stannp.com campaigns, by cleaning your data to remove undeliverable recipients before sending your campaign. The process is remarkably easy and can be applied to both your existing recipient groups on the Stannp platform and also to new data when you upload it to the platform. At this point you are free to carry on with creating your campaign on the Stannp platform or even close the page, the health check will still run. Our system defaults to checking your data for you; if you leave the tick in the box it will run the health check for you as the data uploads and report the results. Alternatively, if you don’t want to run the health check all you need to do is un-tick the box before clicking the IMPORT DATA button. Gone Aways; the recipient has moved house. Deceased; the recipient has been registered as deceased. Mail Preference Service; the recipient has registered themselves with the Mail Preference Service and therefore doesn’t want to receive unsolicited advertising. Using the tick boxes on the left you can choose to supress recipients in any or all of these categories before sending a campaign, depending on your campaign goals. For example, if you are sending an enveloped letter to existing customers you might want to still include those who are MPS registered, whilst removing those who are deceased and gone away. Alternatively, if your campaign is an advertising postcard to new prospective customers, you might be happy to still include gone away and deceased recipients as there is likely to be someone else living at that address, but will want to remove anyone who is MPS registered. 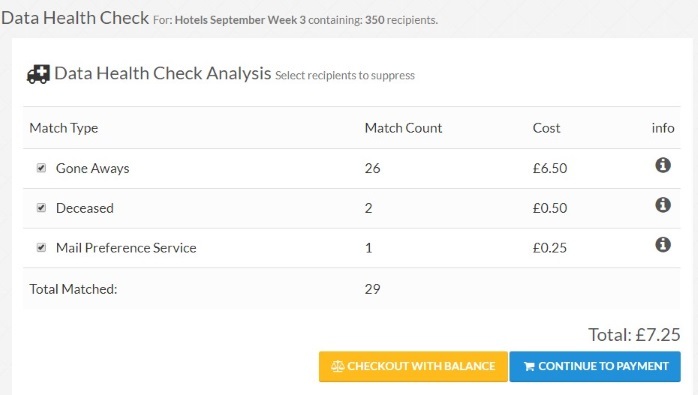 As you select the recipients you want to supress the total cost will be displayed on the right-hand side. When you are happy with your selection you can either checkout with your existing Stannp platform balance or click the CONTINUE TO PAYMENT button to pay for the service directly. It costs £0.25 to suppress a record but it could cost £0.46 to send one a5-postcard to that same person. Suppressing undeliverable recipients saves you money, helps you to comply with GDPR, and improves your campaign response rates, by only sending your mailings to amenable recipients. Once you’ve paid our system will create a new cleaned recipient group for you, with the data removed for the recipient types you’ve selected. Your original group will not be deleted or flagged and will still show on your list of recipient groups on the Stannp.com platform. Q: What’s the difference between this Health Check and the free data cleaning the Stannp platform already does on my data? A: The free data cleaning compares the addresses you have uploaded against the Royal Mail Postcode Address File (PAF), which is their database that contains all known delivery points and postcodes in the UK. Our platform separates them into PAF matched, not matched, and international categories. Not matched and international addresses incur additional delivery charges from Royal Mail. The Health Check compares the recipients in your data against records of deceased, gone away (recently moved) and Mail Preference Service (MPS) registered individuals. An address that correctly PAF matches may still have a recipient listed that is deceased, has gone away or have registered themselves with the MPS, and you may therefore prefer not to send your campaign to them. Q: Why should I pay for this rather than just sending the campaign as it is? A: Firstly, it saves you money! Suppressing an undeliverable record costs £0.25, whereas it could cost £0.46 to send one a5-postcard to that same person. It also helps you to comply with your GDPR requirements by keeping your data up to date, improves your campaign response rates by only sending your mail to amenable recipients, and improves your customer service by not annoying unintended recipients with unwanted mailings. Q: Why are Stannp doing this rather than just sending the campaign as it is? A: We are always looking for ways to improve the service we can offer our customers. We’ve deliberately priced this service so that removing undeliverable recipients is cheaper than just sending the mail; reducing waste and allowing us to offer a better service to both our customers and their intended recipients. Whilst GDPR doesn’t apply to direct mail, using this service also helps our customers meet their data management requirements by keeping their data up to date.